Way back in medieval times valuables were kept in sometimes beautifully decorated chests, now mainly to be seen in Museums or Churches. Initially they were made of wood with iron hinges, locks and metal strappings. From about 1790 the chests came to be made of cast iron, with their lids having elaborate bolt work, extra security being provided by the keyhole disguised inside external decoration or hidden beneath a secret flap. E. Tann & Sons with their factory in Hackney, London was among the first of such manufacturers making iron chests from 1795. The chests were made as strong boxes from about 1820. Initially they were constructed of cast iron, but due to its brittleness and the likelihood that chests could shatter were they to drop in a fire, soon after wrought iron was used in the manufacture. As developments progressed towards making a modern form of safe, around 1828 Thomas Milner began to make boxes with outer cases having an inner lining of strong tin plate and sheet iron. This left a surrounding chamber to receive a non-conducting substance of hardwood and sawdust mixed with alum to provide a better measure of fire protection. When subject to heat the alum would melt and dampen the sawdust, thus reducing the conduction of heat to the interior of the box. Development continued to improve the quality of safes and in 1834 (February 13th) William Marr obtained Patent No. 6555 to improve fireproofing; followed by Charles Chubb's Patent No. 6832 on 1st May 1835 to case harden plates to protect against burglary. However safes were not marketed until the early 1840s that could successfully protect their contents against major building fires. In 1840 Thomas Milner obtained Patent No. 8401 (26th February) to make his safety boxes fireproof. That was achieved by using absorbent material permeated by moisture when a fire occurs. It could be provided either in the form of a liquid contained in tubes, which would burst or otherwise discharge their contents when subject to heat; or is mixed with the absorbent material as water of crystallization in combination with an inorganic salt. That was probably the time when safe making came of age and perhaps around the start date when their makers were to provide nameplates. Over in America manufacturers tended to provide a year date on their safe plates, which greatly helps our knowledge. Those bearing the earliest dated plates were made by Crandall Rich (see photo above) and Enos Wilder in 1842. Many American plates, including that above incorporated the word "Salamander", a lizard-like animal that was anciently believed able to live in fire; so the manufacturers obviously thought this was quite the appropriate thing to exhibit! 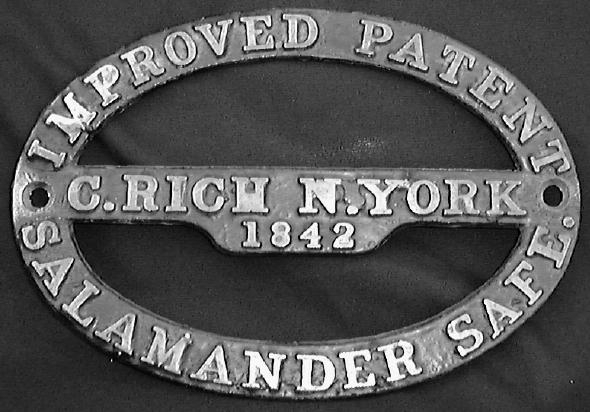 Some British makers also incorporated a salamander figure on their safe plates over the years, though not seemingly to the same extent. 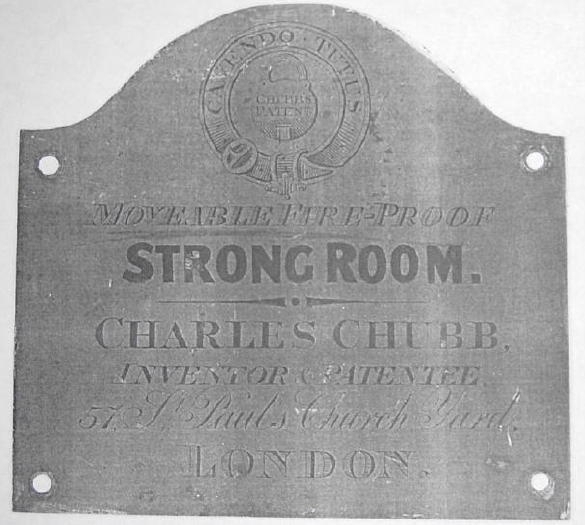 Of the two earliest British safe makers Chubb's did not have a facility to manufacture until 1836 when a factory was built to make safes in Cowcross Street, near Smithfield Market in London. Before that, the records of our first safe makers Edward Tann in Hackney show that they supplied 1,102 of their chests to Chubb from 1828 to 1836. Here below is a photo of a very rare Chubb plate provided by Paul Prescott that might date from around that period. Paul says this was taken from a photocopy and he has reliable information that the plate came from an old safe that was later refurbished with the addition of two No. 3 Chubb bank locks. He was told that at the close of each days business the safe was lowered into the floor and a cover locked over it (see "Well Safe" patent below). The wording "Charles Chubb, Inventor & Patentee" certainly does suggest an early date as he died on 16th May 1846 and his only safe related patents was that of 1835 mentioned above and (together with Jeremiah Chubb) on June 11th 1839, No. 8100 for "Well Safes". Also their locks I have seen up to 1838 are stamped "Chubb's" - like that in the impression of a padlock on this safe plate. But a lock of 1839 is marked "Chubb & Son". So this could be pre-1840 perhaps and if so extremely rare.